From Carpet-Wetter To Film Icon: How Terry The Terrier Became Toto Terry starred alongside Judy Garland in a career-defining role: Toto in The Wizard of Oz. But before that, she had to conquer an embarrassingly weak bladder. Terry the terrier earned $125 a week on the set of The Wizard of Oz, more than many of the human actors in the film. It was the kind of moment that has defined the lives of many young performers and future stars. Abandoned by her birth parents, Terry had spent the better part of three weeks hiding under the bed of the German couple who had taken her in. Crippled by anxiety and shyness, life seemed like one big rug stretching endlessly ahead, and Terry — a 1-year-old cairn terrier — was a carpet-wetter. But Terry refused to be defined by a weak bladder. She came out from under that bed, channeled her insecurities into her training, and just five years later she was on top of the world. 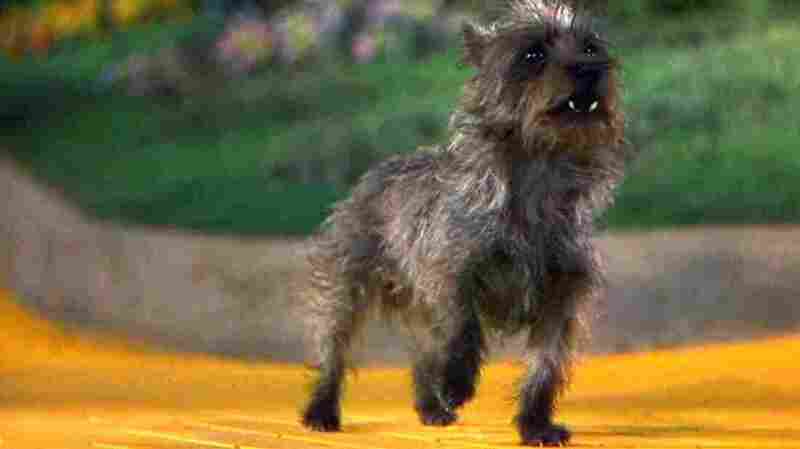 No longer an insecure carpet-wetter but Toto, with a career-defining role in The Wizard of Oz, which opened in theaters across the country 75 years ago Monday and turned Terry into perhaps the most beloved animal in Hollywood history. Born in Altadena, Calif., in 1933, Terry had the good fortune to grow up in a golden age for canine film performers, many of whom honed their acting chops at Carl Spitz's Hollywood Dog Training School. Spitz, the sweet-natured German who had taken Terry in, had trained military and police dogs during World War I before immigrating to the U.S. in 1926. It was an exciting era in Hollywood as the industry transitioned from silent to talking pictures. Off-screen instructions to on-screen canine performers could no longer be barked out by their handlers, and Spitz's innovative system of silent hand signals gave his protégés a huge advantage. When Terry arrived in Spitz's charge, his elite training school already boasted a number of burgeoning canine stars. Buck, the school's St. Bernard, was set to star opposite Clark Gable in the upcoming Call of the Wild (1935). At first, Spitz and his wife, Alice, had decided to keep their young, troubled terrier as a household pet, but Terry, who had been picking up some of her own tricks, had bigger ambitions. When an entourage of Hollywood executives accompanied Gable to Spitz's kennel to visit Buck, Terry caught their attention, and soon she was accompanying her trainer to Paramount Studios for auditions. Guided by Spitz's expert hands, Terry landed her first part as an uncredited dog in Paramount's 1934 romantic comedy Ready for Love. Later that year, she got her big break after she charmed a 6-year-old girl named Shirley Temple, landing the role of the child star's canine companion in Bright Eyes. In no time, Terry had become Spitz's most marketable performer, starring with Spencer Tracy in Fritz Lang's Fury (1936) and Mickey Rooney in Stablemates (1938). In between shoots, Terry's life at the Hollywood Dog Training School — which spread out over 10 acres near Los Angeles' Laurel Canyon Boulevard — was idyllic: large, grassy play areas; porcelain bathtubs; and homemade vegetable and beef bone soup served daily. Despite the creature comforts and steady paychecks, Terry hungered for a meatier starring role. When Spitz learned that MGM was planning to translate L. Frank Baum's The Wonderful Wizard of Oz onto the silver screen, he started putting Terry through the paces — sitting, barking and chasing witches. Terry was not only his most gifted performer but, based on the illustrations from Baum's book, she was also a dead ringer for Dorothy's dog, Toto. Everyone knows that Toto drives The Wizard of Oz's plot more than any other character: He is the reason Dorothy doesn't make it into the storm shelter in Kansas, and he's the one to unmask the wizard's true identity. But to land the role of a lifetime, Terry would not only have to cross gender lines to play the male Toto, but she also had to beat out the 100 or so dogs that MGM producer Mervyn LeRoy was auditioning each week for the job. The well-prepared Terry landed the role, forming an instant bond with the film's star, Judy Garland. On the set of The Wizard of Oz, Terry pulled down $125 per week, more than many of the human actors in the film. And she earned every penny. After weeks of the jitters, she learned to hide behind her fellow actors when the terrifying wind machines were activated. She was just getting comfortable on set when disaster struck. While rehearsing a scene, one of the Wicked Witch's soldiers accidentally stepped on Terry, spraining her paw. Spitz found another terrier to stand in for Terry while she recovered. She returned a few weeks later, but both she and Spitz were beset by anxiety for the remainder of the shoot. The final product, however, was spectacular. The Wizard of Oz, released in August 1939, would become the most watched film of all time, and Terry, who was subsequently re-christened Toto, became Hollywood's most beloved dog. She would go on to star in several more films and make countless public appearances before her death in 1944. Terry's pup, Rommy, would even follow her into the spotlight. Terry's roster of 17 feature films in 11 human years represents a career that could proudly measure up to most of her noncanine co-stars. But in doggy screen years, Terry's body of work, equivalent to over 80 films in 57 years, is nothing less than remarkable — and a true inspiration to carpet-wetters everywhere.